Last Thursday our design project with Johannes Gymnasiet moved along toward a final exhibition of student solutions to better their academic and social spaces. With the students of classes 1.z and 2.z, we used a multi-step method for teaching how to use design thinking in a hands-on, participatory way. After the initial seminar discussed in the previous blog post, arki_lab lead an urban run in Copenhagen and two additional design thinking workshops before asking the students to put their ideas to action.During the urban run, students visited several of Copenhagen’s urban spaces, equipped with a map and background briefs. The students paired up and visited each site in order to reflect on themes of sustainability and temporary use that the project targeted. Superkilen, Jagtvej youth house garden, Papirøen, and Dome of Visions were some of the places that the students visited on their way through the city. The students were asked to reflect on questions like how can design promote sustainability? And why is the design process so important? With the knowledge gained from the urban run, the students were ready for a design-thinking workshop in two parts. During workshop #1, Jeanette introduced the first three steps of the design thinking sequence: emphasize, define, and ideate. In a group setting, the students took turns proposing potential activities for identified sites around the school. Then, they played rounds of “yes, but” and “yes, and” to analyze each other’s proposed ideas. These exercises demonstrated how creative collaboration is effected positively or negatively by the way we communicate our critiques and concerns during the brainstorming process. Workshop #2 used the arki_nopoly democratic design game to continue the development of their design thinking skills, first by picking up where they left off with ideation. They were broken up into groups and assigned to one space to focus their design efforts. After playing arki_nopoly in their respective spaces, the students reflected on their conclusions from the game and prepared to prototype potential solutions to existing problems in the school areaduring our next meeting. For the rest of the week, we set up a pop-up office at Johannes Gymnasiet so that we were available during the prototype and test phases of their project. The students learned how to diagram, collage, and present their ideas in the strongest way possible. The last days were intense and the students made a lot of efforts inviting prominent and local people to the final exhibition. 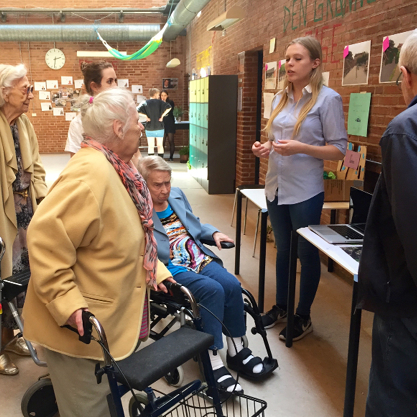 During the Thursday exhibition, politicians, the Danish Architects Association, and members of the neighboring nursing home attended to discuss the students’ ideas. We consider the Johannes Gym collaboration a success, as the students learned to analyze a problem and then come up with solutions using the design thinking method. This process can be applied to many assigned tasks in their futures, whether or not they become designers. New ways of learning are necessary to incorporate into school curriculums. We saw it first hand during some of our own lessons: lecturing for too long loses the attention of young minds. The future of learning is hands-on and participatory, and we are excited to advocate for this teaching method in all of our school collaborations. A special thanks to the Culture Agency (huskunstnerordningen) for making this cooperation possible!